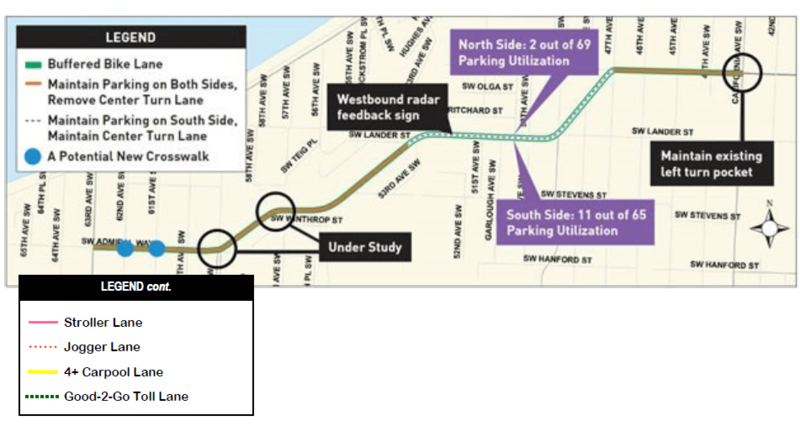 Fauntleroy Way: Key elements include paving, adding a protected bike lane, transit enhancements, and signal upgrades, improving safety and reliability for all travelers. Sounds terrific for Vashon Island comutters. How much $ are they contributing again?? Roxbury Street & 35th Ave: Over the last three years, 294 collisions, 128 injuries, and 2 fatalities have occurred. We are currently planning and designing near-term safety improvements paired with education and enforcement, working towards the city’s Vision. I believe a majority of these accidents occur from drivers slamming on their breaks trying to avoid the traffic-cop camera’s mailing out $190 tickets for doing 22 in a 20mph School Zone… when lights are flashing or children present or distracted by taking your eyes off the road to get a read on the myriad of signs designed to “educate us”. SW Alaska Street: The levy would provide funding to make safety improvements like redesigning the roadway. That’s an easy one. Just put the design back to where it was before adding the “bus only” & the staggered right turn only lane. Can you imagine being an out-of-towner trying to drive that stretch all the way to the junction? Encourage slower speeds Tell that to the bikers doing 40 mph down the hill. Accommodate existing maximum on-street parking occupancy There’s plenty of occupancy in motor homes & vans along Beach Drive. Provide a comfortable and predictable bike connection between Alki and California Ave business district Why just bikes? 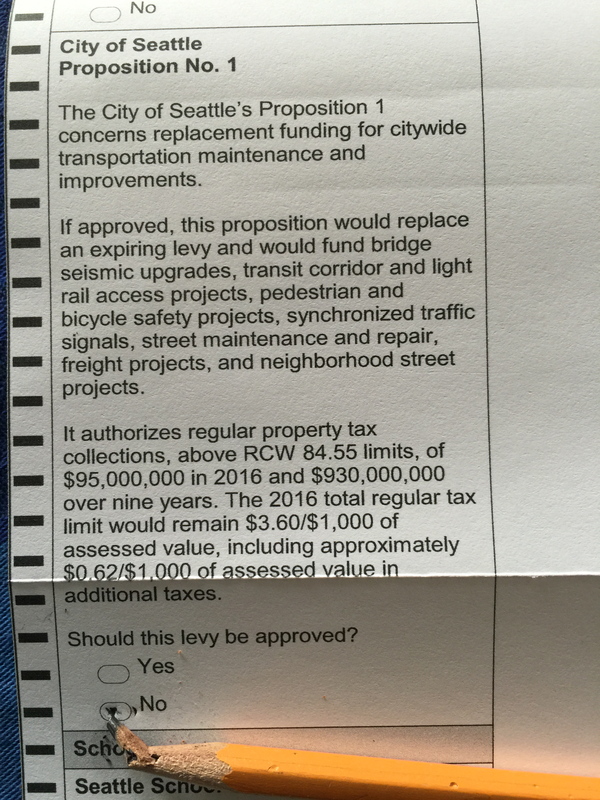 The rest of the levy just repairs what we already have at a cost of $275 per year per household (median household of 450K) as opposed to the $130 we’re currently paying with the Bridge the Gap levy. I’m convinced that the rest of the city just believes we West Seattleites love a good parade and need to slow down. While crawling in traffic between Admiral & Fauntleroy junctions yesterday, I reminisced of escorting my HiYu princess along California Ave. I wanted to roll down my window and give the float wave to all the angry impatient drivers heading the other way. If you ask me, the rest of the city better look out. Old timers tell us it only took 71 years to get the high level bridge over the Duwamish! Seattleites endured in trying to secure a high-level bridge that would get them to and from “the mainland” without being held up by boat traffic along the Duwamish River. West Seattleites began campaigning for the bridge in 1916 and at one point threatened to secede from the city if it didn’t deliver. Thank goodness we now have the West Seattle Bridge. Where else can you sit in traffic all day, soak in the wonderful views and dream of the day Starbucks can land a 4th cup of jo on your car hood’s drone pad. They first named Alki “little New York” when the city founders came ashore. Now with all the new high density residential buildings coming on-line, we are becoming the “little Manhattan Island” of Seattle and could use a transportation plan that helps us get around. Scupper, you are spot on regarding Prop 1. I just filled out my ballot and I couldn’t mark NO fast enough? They need to figure out a rail option for us before I mark YES!